There's an ongoing debate among bodybuilders about which type of creatine works best. This can cause a lot of confusion and frustration on your part when it comes to choosing your creatine supplement. Eliminate your doubts! You can now harness all the powerful benefits of 6 different creatine forms with Scitec Crea-Bomb! 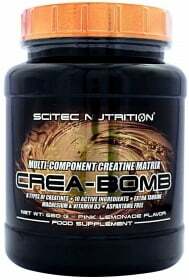 Scitec CreaBomb is a total creatine supplement which provides your body with 6 of the highest quality forms of creatine, plus amino acids, vitamins and minerals that support optimal energy, without the use of stimulants. Creabomb is designed to greatly improve the quality of your workout sessions, supplying you with more strength and volume and allowing you to achieve much better muscle-building results. Multi-Creatine Matrix (Creatine Monohydrate, MicronTec Micronized Creatine Monohydrate, Kre-Alkalyn [buffered Creatine Monohydrate], Creatine Pyruvate, Creatine Citrate and Creatine Phosphate) – this dynamic blend of creatines is easily absorbed and readily accepted by the body for faster results in boosting raw strength, volumizing the muscles, enhancing athletic performance, increasing energy levels and developing lean muscle mass. This blend also helps buffer lactic acid buildup while you workout, prolonging endurance. Support Matrix (Taurine, Magnesium Oxide, Malic Acid and Vitamin B3) – increases your exercise capacity, promotes normal energy-yielding metabolism, boosts cellular energy production, supports optimal nervous system health and maintains proper electrolyte balance. Why settle for just one type of creatine? Bombard your muscles with 6 of them and get total results with Scitec Creabomb! Have a question about Creabomb? What is it, what does it do, how and when to use or something else? Ask us. “Crea-Bomb 120g” is currently out of stock. Enter your details below and we will let you know when it's back in stock. ALLERGEN INFORMATION: Manufactured in a facility that processes milk, soy and egg proteins, and gluten, peanuts! Mix each serving with 400 ml water! For a loading period, take a serving of CREA-BOMB for every 15 kg of your bodyweight daily (this way Creatine will saturate your muscles faster). Spread out these servings throughout the day and take them before meals. After 5 days, take only 1 serving a day for maintenance. If you wish to forgo a loading period, immediately start with 1 serving. Use as part of a healthy, balanced diet. WARNINGS Creabomb : Keep out of reach of children. Store in a cool, dry place. These statements have been scientifically proven and authorized by the European Food Safety Authority.